Rolling hay meadows lead to forested hillsides, with the ever-present chatter of pine squirrels and the rustle of quaking aspen leaves. The landscape invites one to meander and explore this exquisite park. Previously a working ranch, Meyer Ranch Park offers peaceful strolls through wildflower-laden meadows, lodgepole pine forests and aspen groves. If you’re looking for “Colorado Gold,” you will not be disappointed with an autumn visit. Winter snow brings out cross country skiers and sledders to a hill overlooking U.S. Route 285. Meyer Ranch is truly a park for all seasons. The parking lot is on the east side of U.S. Highway 285, approximately 1/2 mile east of Aspen Park. The United States Congress designated the Mount Evans Wilderness (map) in 1980 and it now has a total of 73,459 acres. All 14 miles of the road from the entrance station to the Mount Evans summit parking area (14,130) are paved. From there, you can hike the last 130 feet (about 1/4 mile walk) to the top at 14,264 feet. Evidence of past glaciers can be seen in the steep granite cirques and glacial moraines surrounding the high peaks. The Wilderness contains small regions of arctic tundra, rare south of the Arctic Circle. Mount Evans is accessed by a 105 mile trail network, 77 miles of which are within the Wilderness boundary. 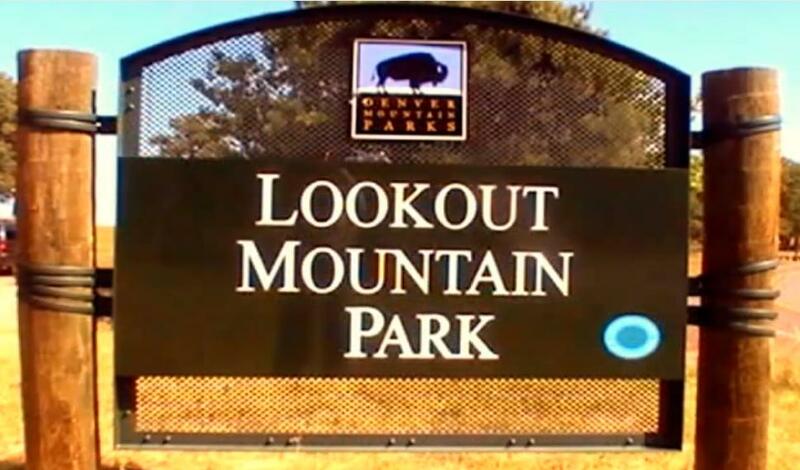 Mount Falcon Park is a rewarding gateway from the plains to the mountains, offering panoramas that stretch from snowy peaks to Red Rocks Park to the Denver cityscape. A captivating history tops off the park experience, symbolized by the ruins of a broken dream. Hikers have 1.7-mile Turkey Trot Trail all to themselves. The remaining 11 park miles are multi-use. The 2,000-foot elevation gain of the Castle Trail, a steep climb from the east, provides a vigorous workout and a 14er training ground. From U.S. Highway 285, take the Indian Hills turn-off, follow Parmalee Gulch Road for 5 miles to Picutis Road, then straight ahead to Mount Falcon Road. From State Highway 8, turn west on Forest Avenue and north on Vine Street. Come for the challenging terrain, stay for the views. Mount Galbraith Park is a hiker-only destination, boasting nearly five miles of steep, rocky trails that reward the hardy with commanding views of Golden, the plains and the Continental Divide. The Mt. Galbraith Loop circles 1.6 miles around the top of the 7,260-foot peak. In addition to the vast and varying landscape, keep your eyes peeled for the elk, bighorn sheep, red-tailed hawks and songbirds that frequent the area. From State Highway 93, take Golden Gate Canyon Road west approximately 1.5 miles to the parking area and trailhead. 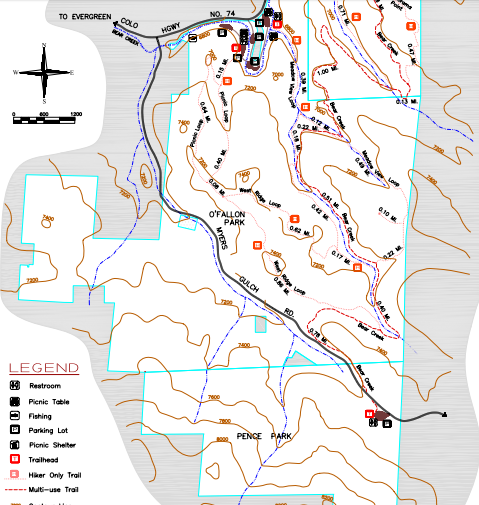 O'Fallon Park is part of a series of Jefferson County and Denver Mountain Parks that are connected by Bear Creek and the Bear Creek Trail, and borders Pence Park. Picnic by Bear Creek, with several trails to choose from. O'Fallon, Pence and Corwina parks encompass 1480 acres in Bear Creek Canyon preserved 1914-1938. Spacious creekfront park providing hiking trails, mountain biking terrain, fly fishing & open space. O'Fallon Park Upper Loop Trail is a 3.7 mile loop trail located near Evergreen, CO and is rated as moderate. The first 3/4 mile is fairly steep. Access from April until October. Famous for it's red rock outcroppings formed about 290-296 million years ago, the 804-acre park was preserved 1927-2001. Within the park boundaries is the Red Rocks Amphitheater, a world famous venue used since 1941, which hosts many concerts and other events. The Red Rocks Trail trailhead is located across the street the road from the parking lot. Trails can be challenging and slushy or muddy in the pre-spring months. Paragliders and hang gliders take flight from 7,059-foot Mount Zion, mountain bikers churn along Chimney Gulch Trail and hikers have Beaver Brook Trail to explore. The trail system connects to Lookout Mountain Nature Center, which has its own interpretive trails. Cyclists dissect the park on their climb up Lookout Mountain Road, a 4.3-mile ride of passage with a 1,200-foot elevation gain. Enjoy stunning views simply by parking at the trailhead. 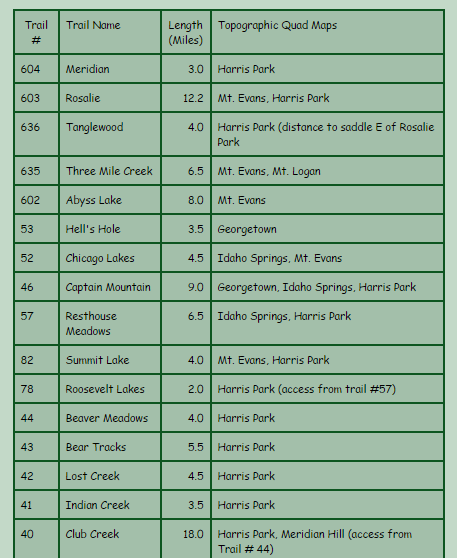 The park lives up to its name, with strong drafts blowing down from the Continental Divide. 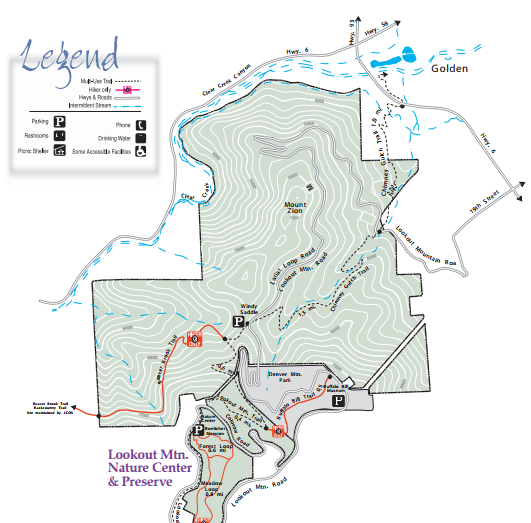 The Windy Saddle trailhead is off Lariat Loop Road/Lookout Mountain Road, 0.9 miles from the brick pillars on the west side of the road, or continue 2.8 miles and turn right on Colorow Road for 0.6 miles for Lookout Mountain Nature Center. These areas can also be accessed via I-70 and US 40. Informal parking for the lower section of the Chimney Gulch Trail is on the south side of 6th Avenue, across the road from the Colorado School of Mines football field.